Just wanted to bring this fantastic quarterly publication to your attention. 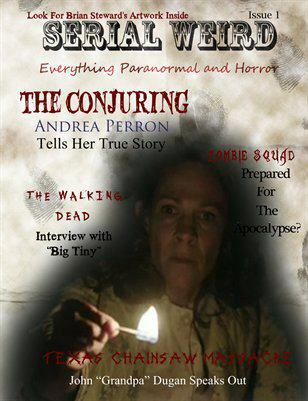 Its filled with stories, interviews and factoids, all surrounding the paranormal/supernatural. Next issue is released in mid-July. Look for my article about Jay Verburg from SyFy Channels Ghost Mine. Also, if your really into horror movies and books, follow me and my friends on Icons Of Horror, on Facebook. You will find a lot of pictures, movie information, reviews, and conversations all based on your worst nightmares. So come have some fun with us. Everyone have a fantastic day and I will see you tomorrow!